Located on the edge of the starkly beautiful Sahara Desert, Merzouga is a small, dusty town in eastern Morocco. 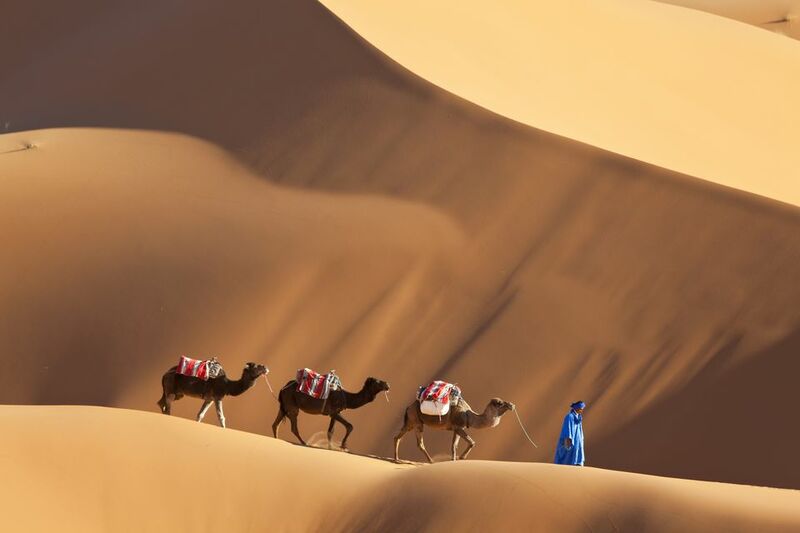 Although the town itself has little to offer the intrepid traveler (besides a handful of hotels and restaurants), it is famous as the gateway to the vast Erg Chebbi dunes. Here, soaring peaks of sand change color with the shifting light of dawn and dusk. Camel trains create romantic silhouettes, and Berber villages act as remote oases in an environment that has remained unchanged for thousands of years. These are the archetypal Sahara landscapes of which Moroccan dreams are made. Life in Merzouga revolves around the nearby desert, and the most authentic way to experience it is on camelback. Several operators offer the opportunity to join a camel safari into the dunes. Many of these tours include an overnight stay at a desert campsite, or in a traditional Berber village. The former offers the unparalleled romance of a night under canvas beneath the blazing desert stars; whilst the latter allows you to sample unique Berber food, music and culture. Tours vary greatly in cost and comfort, so make sure to shop around before you decide which option is best for you. Of course, the Sahara also provides ample inspiration for a number of adrenalin-fuelled activities. If you prefer the thrill of an engine over the swaying gait of the Merzouga camel trains, opt for a quad bike tour instead. Trips can last a few hours or several days, but all of them give you the chance to indulge in some serious off-road fun. Those with quads of steel can try their hand at sand-boarding or sand-skiing - kind of like traditional snow skiing, only considerably hotter and without the convenience of a ski lift! Hot air balloon rides over the dune sea can be arranged. Although pricey, witnessing the splendor of the Sahara from a unique birds-eye perspective is a truly once-in-a-lifetime experience. No matter how you choose to explore, keep an eye out for fascinating desert-adapted wildlife in and around Merzouga. The dunes are home to unusual reptiles including the Berber skink and the fringe-toed lizard; while large-eared mammals like the jerboa and the fennec fox come out to hunt under cover of darkness. In particular, Merzouga is a good destination for birders. Nearby saltwater lake Dayet Sriji provides an oasis for greater flamingos as well as a collection of egrets, storks, and ducks; while the dunes themselves harbor native desert birds including sandgrouse and bustards. Located 350 miles/ 560 kilometers east of Marrakesh, Merzouga is relatively remote. The nearest large city is Errachidia. If you want to avoid the long drive from Marrakesh, consider flying into Errachidia's Moulay Ali Cherif Airport via Royal Air Maroc instead. From there, it's a two-hour drive to Merzouga. If you'd rather save money, CTM and Supratours operate overnight buses between Fez and Merzouga, as well as a long bus from Marrakesh to Merzouga. There are also plenty of tour companies offering extended itineraries from Marrakesh and Fez. These include a guide, different organized activities and 4x4 transport, and usually, last for several days. Although three days tours are popular, opt for a four or five-day tour if you can so that you get to spend more time admiring the desert scenery. Some tour companies offer a trip that starts in Marrakesh and ends in Fez, stopping off in Merzouga en route. In the Moroccan summer (June - September), Merzouga and the western Sahara Desert can be brutally hot, averaging around 45ºC/ 115ºF during the middle of the day. March and April are often plagued by the sandstorms of the seasonal Sirocco wind. Therefore, the best time to travel is from October to February, when daytime temperatures are pleasant and the chances of sandstorms are slim. Bring plenty of layers, as temperatures drop dramatically after dark. Rainfall is almost non-existent throughout the year. Recommended accommodation options in Merzouga include Hotel Kasbah Mohayut, a good value hotel with a swimming pool and stunning dune views. Auberge Les Roches is an excellent option for travelers on a budget, with affordable room rates and a tasty free breakfast. Guest House Merzouga is another quality B&B, made special by a rooftop terrace with beautiful Erg Chebbi vistas. Family-run, this is Berber hospitality at its very best.